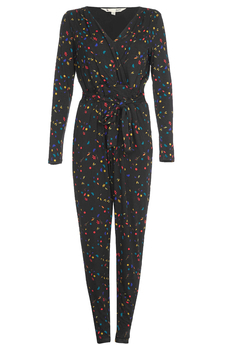 Retro Bauhaus Jersey Jumpsuit has a timeless shape and retro charm. Made from fluid super soft jersey fabric and printed with geometric shapes and abstract flower pattern, has a wrap-over top and self-tie waist. It simply slips on and is approx. 140cm in length. Winter collection. Composition: 95% Viscose, 5% Elastane. Color: Black.